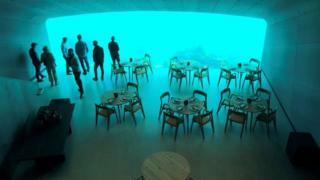 Europe's first underwater restaurant has just opened in Norway, and already more than 7,000 people have booked in to eat there. It is called Under, and has a large dining area with by a gigantic window through which you can see the ocean. But this isn't the only unusual place you can eat your dinner! Pick your favourite from these! I think my mum went to the blind restaurant once. I would love the go to the giraffe manor in Kenya as it would be so cool.